“What no eye has seen, nor ear heard, nor human heart conceived, what God has prepared for those who love him” (See 1 Corinthians 2:9 NRSV). Christine Valters Paintner in her book, Desert Fathers and Mothers: Early Christian Wisdom Sayings, Annotated & Explained wrote, “We often move through life skimming the surface with our eyes. Our eyes become tired and blurry and we no longer see the sacred shimmering before us” (see pages 32-33). In The Rule of St. Benedict, he quotes the words of 1 Corinthians 2:9 at the end of Chapter 4 On The Tools for Good Works. St. Benedict invites us into contemplation that what God does with what we have is beyond anything we can grasp with our human senses. When we let go of being the ones that must always determine the outcome of something we do or say; God’s plans for us still remain mysterious. Yet, they are all that much more wonderful than anything we can “ask or imagine.” (See Ephesians 3:20, 21). Anything that may be going on in our lives at this very moment, is an opportunity to let go and to love and trust in God. Whether what is happening is something that goes as we had hoped for or not; God’s plans for us are extravagant. In contemplative prayer we “listen to God with the ear of the heart.” We do not have to have everything defined so neatly and perfectly. Letting go of that desire is so very challenging, because we like things delivered to us perfectly wrapped up in a pleasant surprise. God opens up our hearts to what God has for us, because of God’s love for us, and God’s desire in us is to love God with everything we have and are. God’s mysticism is for us to open our hearts to thankfully receive; and to live into so that the world can be transformed and renewed by God’s Holy Spirit. Where in your life are you experiencing God showing you amazing things? If you feel led to buy me some coffee to help keep this ministry going, please scroll to the bottom of the right side bar and click on the Benedictine Coffee Mug. Thank you so veyr much. “For I do not seek to understand so that I may believe; but I believe so that I may understand. For I believe this also, that ‘unless I believe, I shall not understand.” (Isaiah 7:9) (The Proslogion by St. Anselm of Canterbury. Anselm of Canterbury: The Major Works, Oxford Classics, p.87). 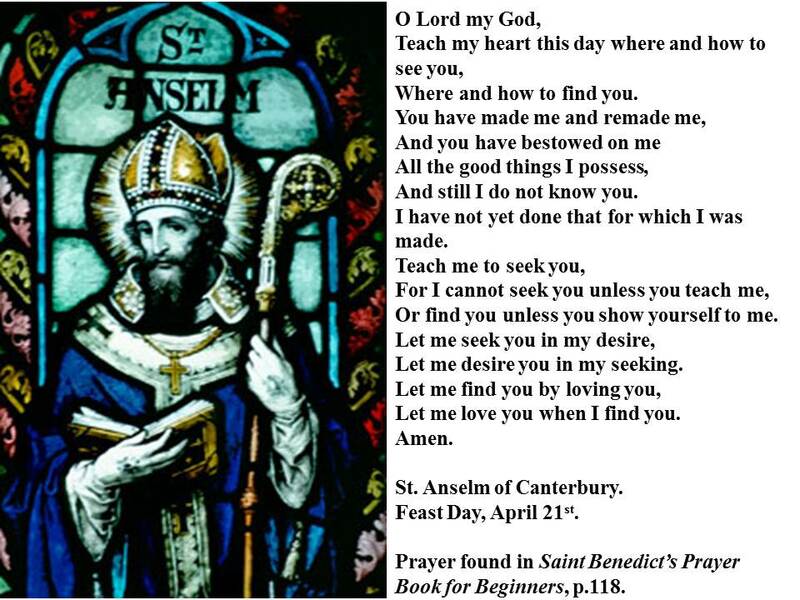 The commemoration of St. Anselm of Canterbury is celebrated only every few years on April 21st. It is often over taken by either Holy Week or Easter Week. This year, however, we get to celebrate him on his feast day. As I was approaching the end of my Postulancy to be Clothed as a Novice in May of 2013, I thought a great deal about what name I would ask for. Anselm was at the top of my list. I have many reasons for this choice. The prayer in the image above that sums up Benedictine Spirituality so beautifully is one of those reasons. The other reason is that beginning in 1997 to 2000, Fr. Anselm Atkinson, OSB who is now Abbot Anselm of Pluscarden Abbey in Scotland was my very wise spiritual director. I cherish the many things he taught me as we worked together. Anselm was a scholar and an intellectual. He was a great teacher and writer of the Christian Faith. Yet, as the above quote states, what he thought was worthless without the element of faith. Faith and wisdom were among his many guiding principles. His writings can lead us into the contemplative vision of God through his deep humility. I can only hope that some day I will gain just a piece of that wisdom. I could write many thoughts for reflection on St. Anselm, and they would all have their legitimacy. However, I think it is best to conclude this blog by letting St. Anselm do that for us. “While I am here on earth let me learn to know you better, so that in heaven I may know you fully; let my love for you grow deeper here, so that there I may love you fully. On earth then I shall have great joy in hope, and in heaven complete joy in the fulfillment of hope.” (From the Proslogion by Saint Anselm, The Liturgy of the Hours, Volume II, p.1775).